More important considerations related to getting a horse or two! Horse ownership is a long journey with multiple challenges. That is what makes it worthwhile. I bought a mare who was an older foal (she was under a year old) and was a royally bred Thoroughbred, BUT I also bought Tom Dorrance at the same time and it was his workbook that I used religiously to ground train Nan. Only once did someone climb up on Nan’s back before she was 5 and she got on and then got right off - have to say though that Nan never offered any resistance to her training. I brought that book into work every day, that is where Nan boarded and 5 days a week I worked on copying the pictures in the book and when Nan looked like the picture, I moved on to the next stage - until we got to the saddle part and I did not know how to ride so I began to long rein train her or ground drive training and I did that until she was 5. I moved to California, took Nan with me (told the boyfriend if he wanted me, then the dogs and the horse were a part of the package) and after being turned down by 5 or 6 trainers who said NO WAY I found Reed - who then finished Nan, trained me and gave me the foundation of where I am today. Figure out who the horse is and then ride THAT horse. I moved back to Texas and Reed came with me as a trainer on my ranch. When I started to lose my confidence with Nan; he was the one who helped me decide on the purchase of Misty. I then competed on Misty for two years in NATRC (North American Trail Ride Conference) and I learned even more on a finished horse. When I came back to Nan, I then had the confidence to work through our issues and become an even better rider and partner to my horses. Along the way I have learned to deal with and make decisions I never thought I would have had to. I have written about many of these experiences, and they have been published on EquiMed's website. So you have decided to go ahead and get that horse. You will have to learn how to have a life that puts their needs as a priority. Here is the overview of my life with two horses and a busy personal work/business life. 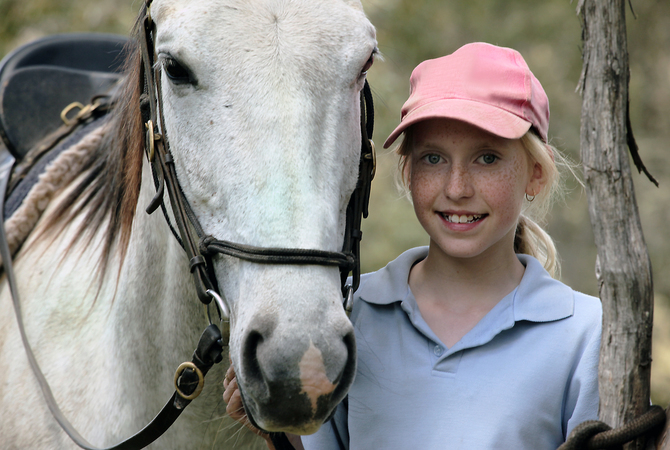 Horses can live very long lives (up to 30+) if taken care of well. Getting up in the morning and feeding them; picking the poop up and cleaning their pens and turnout area so that our pest issues are minimal. That includes fly and internal parasites. Afternoons spent doing the same thing and changing out their water daily so that I do not have a mosquito issue either. Weekends are spent riding as the girls are old enough and well trained enough that I can ride them on the weekends only - HOWEVER lest you think that I do not work with them EVERY time I interact with them - think again. Every interaction I make sure that we are all on and stay on the same respect page. They move when I ask them to, in whatever direction. They are not allowed to get pushy or invade my space. Just because you do not ride them during the week does not mean that you do not maintain the working relationship on the ground. It has been shown that even as little as 15 minutes 3 times a week will keep a horses training going. Every week I get a bag of feed and 5 bales of hay. Quality hay in my area comes in squares and I have found that with my small pasture I cannot get a round bale. They waste too much of it and most of the time at least 25% of the bale is bad in some form. So I got four Freedom Hay Net bags and I stuff the four bags once a day with about 75% of a normal bale and post them around their pasture to encourage “grazing” behavior. This is their daily graze of hay. This year I have been lucky in that our rainfall has been so gracious that the grass on my small one acre lot has been able to provide at least half of the forage they need on a daily basis. Remember the twice daily picking of poop? Well that is why I can maintain my graze. Clean pasture and regular mowing keeps the weeds away, the internal parasite at minimum and the fly population very low. They hang out on the manure compost pile and in the Texas heat and the rain we have had this year - well that area has some really nice grass growing on it! My landlord also comes by twice a year and collects almost half the pile for himself. YES I am afraid that is a learning lesson we all have to go through … figure out what you need and only have that. I have my Living quarter trailer. Both girls always go with me as both have now been trained to pony the other while I am in the saddle. I camp with my girls and my one remaining dog and we have become our own herd. I frequently ride alone and surprisingly enough it is Nan who is my solo reliable smart trail horse and not Misty. To this day Misty still remains unable to garner the confidence to be on trail by herself. 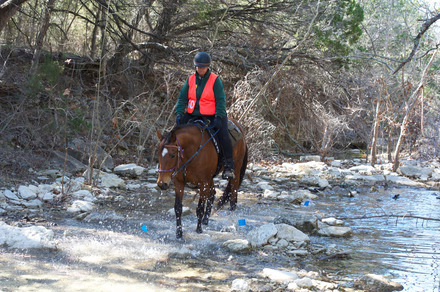 The best piece of advice I ever received was from a very old lady - still riding green thoroughbreds on trail competition and it was: Figure out who the horse is and then ride THAT horse. You will never succeed or be a good partner if you keep trying to tell the horse how it should be ridden. Nan never did make a comfortable competitive horse though we did win pretty regularly; it was always a discussion and one that never allowed us to just enjoy each other, and I retired Misty when she began to be a trip at the trot and canter on trail - we could never really figure out why, so it was easier to make the decision to take her to light trail riding. Though I do keep her in the hopes that in the next few years I can break her to carry packs and do some mountain camping before I get too old (wink). As for the dollar factor: The girls get their once a year vaccines, Coggins and tooth floating and really other than the weekly feed and hay, that is all they cost me. My tack room carries my hay and feed and a current first aid kit and that is IT. I have learned the KIS (keep it simple) method of horse keeping and because I feel no need to change horses for every season all three of us have become our own herd and have a great working and personal relationship … and when they get too old, the service they have offered me and the sheer pleasure they have given me being a part of my life makes the decision to keep them as pasture pets well worth it. My advice-listen and read it all THEN - pick what applies to you and your horse AND your situation. You will find that the rewards outweigh any negatives you may think of. I would not have done anything different and nights when I can sit on my front porch and watch the girls graze the yard … well those nights are just plain magical. Happy Trails.